constituent society of the Federation. Indeed, several of the original organizers of ASEP were leaders of the Federation constituent societies. S.J. Melzer has received the most historical credit for forming a society of experimental pathologists; he was also involved in APS and was elected the chairman of the Conference Committee that organized the Federation. H.G. Wells was a participant of the Federation Conference Committee from the American Society of Biological Chemists. Pearce and Whipple would take the lead (with one other individual to be named later) in drafting the Constitution and Bylaws, which were to be presented to the membership in December 1913. Each member was assessed $1.00 to cover the expenses of the intervening period from May to December. Membership would not exceed 40. The 25 members7 invited to attend the meeting of May 7th constituted the original membership. Ten additional "men" would be selected from a list of 16 names8 that were discussed during the May meeting, based on a mail vote, with the ten names receiving the highest number of votes to be immediately made members of the Society and considered as organizing members. The ASEP, as a "functioning unit,"2 met for the first time under the presidency of Richard M. Pearce at Washington University, St. Louis, MO in the company of the three societies of the Federation. The scientific sessions took place on December 28, followed by business meetings, in which four additional members were admitted (bringing the total number of members to 39), and Theobold Smith, George Whipple, and Peyton Rous were elected President, Vice President, and Secretary-Treasurer, respectively, for the ensuing year. Joint meetings of the four constituent FASEB societies were held December 29-30, 1914. At the time of the formation of ASEP, two other pathology societies already existed. The American Association of Pathologists and Bacteriologists (AAPB)10 was organized in 1900 but traced its roots to The Boston Society of Medical Sciences.11 The American Journal of Pathology (AJP) and the Gold-Headed Cane Award owe their origins to AAPB. The second society was the International Association of Medical Museums (IAMM), which was organized in 1907. In 1955, the IAMM was renamed the International Academy of Pathology (IAP); the United States and Canadian Academy of Pathology (USCAP) is under the IAP umbrella. Also of importance, the American Society of Clinical Pathologists (ASCP) was formed in 1922 and is now known as the American Society for Clinical Pathology, and Universities for the Advancement of Research and Education in Pathology (UAREP) was established in 1966. Gradual increase in the allowed number of members, eventually removing all upper limits. Transition of terms of officers from the end of the annual meeting to July 1 in 1947, a practice that is still in effect today. ASEP was officially incorporated in the State of New York in 1950. ASEP members voted in 1956 to affiliate with (then American Medical Association's) A.M.A. Archives of Pathology, edging out Laboratory Investigation by a vote of 155 to 152. A.M.A. 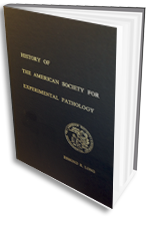 Archives of Pathology (renamed Archives of Pathology in 1960) was the official journal of ASEP through 1969. Ralph M. Knutti, was named ASEP's first Executive Officer in 1965, and an ASEP centralized office was established at the FASEB headquarters ("Beaumont Campus") in 1966 (see Essay 2). UAREP became part of the ASEP office and was managed by ASEP. The Constitution and Bylaws, which had remained largely unchanged since 1924, underwent a major overhaul in 1968. Informal discussions, which had taken place sporadically over the decades, between ASEP and AAPB about a possible merger became more formalized in the late 1960s. By this time, membership in each Society had surpassed 1000. More than 35% of the members of both societies held dual membership. Each Society held meetings each year in the spring, which was inconvenient for individuals with dual membership. AAPB had relatively strong ties with the IAP, and the AAPB leadership flirted with the idea of merging the AAPB meeting with IAP.13 Ultimately, however, many AAPB members felt that IAP had abandoned the original objectives and orientation of the AAPB and had drawn away from cell biology, FASEB, and clinical pathology. Eventually, the AAPB and ASEP leaderships began concrete discussions and proposed a merger to their respective memberships in 1968. Although a majority of both memberships voted in favor of a merger, the required super majority was not achieved. Undeterred by the failure of the merger vote, ASEP and AAPB entered into an agreement to cosponsor AJP, which became the official journal of both societies in 1970. Another attempt at a merger failed to achieve sufficient majority in1972. ASEP would elect to its membership any current AAPB members not already included in the ASEP roster of members. AAPB would turn over all its assets to ASEP, which would be governed by a new constitution agreed to by both parent Societies. The name of ASEP would be changed to The American Association of Pathologists. When the Kinney plan was presented to the ASEP Business Meeting on April 9, 1974, some ASEP members objected to the new name because they were not pathologists. The new constitution for AAP was therefore drafted to allow for increased flexibility of meeting membership requirements. A further complication was that ASEP was incorporated in New York, and AAPB was incorporated in Missouri. Each state had different requirements for voting, which needed to be accommodated. It was finally determined that a vote at the business meetings of the societies would not be legally binding and that a mailed ballot would be used. Effective July 1, 1976, Rolla B. Hill, Jr. (AAPB Vice President 1975-1976) and Henry C. Pitot (ASEP Vice President 1975-1976), would be co-Presidents of AAP. Effective July 1, 1978, Robert E. Anderson (expected AAPB Vice President 1977-1978) and Morris Karnovsky (expected ASEP Vice President 1977-1978) would be co-Presidents of AAP. ASEP would retain its membership in FASEB and continue to participate in the annual FASEB meeting. a. ASEP would change its name to American Association of Pathologists, Inc. (AAP). b. ASEP would amend its Constitution to provide that all persons who as of July 1, 1976 were members of AAPB shall automatically become members of AAP. a. AAP would retain the same position in FASEB that ASEP currently held. b. AAP would continue to meet with IAP each spring, as AAPB had been doing. AJP would become the property of AAP and be its official journal. More than the required two-thirds majority of the voting members of each Society approved the affiliation plan.17 AAP was incorporated in the state of New York in 1976 and maintained its tax-free 501(c)(3) status. ASEP Executive Officer Mider,18 who had administratively guided the ASEP through the merger talks with AAPB, retired in 1975, and Thomas D. Kinney took on Executive Officer19 responsibilities during the actual merger and served as AAP's first Executive Officer. In the late 1980s, AAP faced several challenges due to a planned restructuring of FASEB. A Federation retreat was held September 21-24, 1989 in Williamsburg, VA, to discuss the potential departure of ASBMB and the impact it might have. The participants at the Williamsburg Retreat confirmed the need for an umbrella-like organization for societies of biomedical scientists, and it was decided that a major function of FASEB should be in the area of public affairs. However, a restructuring would be required to make it feasible for large and small biomedical societies to join, and it was agreed that all member Societies in the new FASEB would have equal status and representation on the governing board. The fiscal restructuring of the Federation would require that central services become self supporting and that each Society would pay for only those services that it wished to use. This increased flexibility, however, put additional financial strains on those constituent societies that used more FASEB services. There would also be more flexibility in organizing meetings, both in constructing the format of the scientific program and in the grouping of societies for joint meetings. It would no longer be required that all FASEB member societies meet together at the annual FASEB meeting.20 The benefit of this decision was that it became more palatable for ASBMB to remain as a FASEB member society; however, the revenue distribution from the annual FASEB meeting to the participating societies would change, and AAP was facing a loss of revenue. The Publications Committee served as the search committee for the Editor-in-Chief of The American Journal of Pathology since the current Editor-in-Chief, Vincent Marchesi, and the Associate Editor, Jon Morrow, had served ten years. It was decided that Nelson Fausto would take over editorial responsibility for AJP in July 1992. The Committee was also charged with soliciting proposals for a new publication contract. During the process, the Committee evaluated new forces at play in scientific publishing and recommended that the Society terminate its contract with J.B. Lippincott Co. and self-publish AJP, effective 1993. Thus began an era of increased stature for the Journal, as well as a more financially viable scientific journal (which followed several years of budget deficits). The name of the Society should be changed to the American Society for Investigative Pathology (ASIP)21 to reflect the broad interest in understanding the mechanisms of disease, an interest that extends beyond pathology departments. a. The Council was to be enlarged to twelve members, including six Councilors and the Secretary-Treasurer, four individuals in the presidential track, and the Program Committee Chair. b. To avoid small cliques and to maintain a more open governance, no more than one person from an institution could be on Council (except for the Program Committee Chair). c. Society members would have the opportunity to submit names annually for election to the Nominating Committee and then elect the members from a slate with at least two names for every vacancy. As with the Council, no more than one person from an institution could serve on the Nominating Committee. Jordan Pober convinced the other committee members that allowing the Society members to organize subsections22 (from the ground up) that would represent their own specialized interests could form the basis of an invigorated scientific program at the annual meeting. 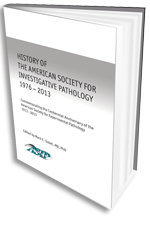 1 ASEP was reincorporated in 1976 as the American Association of Pathologists (AAP), which was in turn reincorporated in 1992 as the American Society for Investigative Pathology (ASIP). 2 This executive summary of the history of ASEP is based on Esmond R. Long's History of the American Society for Experimental Pathology: A Record of Its Annual Meetings with Brief Biological Sketches of Its Officers. Bethesda, MD, American Society for Experimental Pathology, 1972. 3 The APS is the oldest of the FASEB constituent societies, having been formed in 1887. 4 The American Society of Biological Chemists was formed when it split off from APS in 1909. 5 ASPET was organized in 1908. 6 See Appendix 6.1 for details about the participants. 7 In addition to the nine signatories of the April letter, the six other attendees, and the seven members who sent proxies, three other invited members who did not attend or send proxies were considered to be the original 25 members (see Appendix 6.1). 8 Despite the specific mention of "men," one of the 16 invitees was Martha Woolstein; however, she was not selected as one of the ten. 9 The American Institute of Nutrition (now American Society for Nutrition), founded in 1928, became a Federation member in 1940. The American Association of Immunologists, founded in 1913, became a Federation member in 1942. 10 The history of AAPB is detailed in Esmond R. Long's History of the American Association of Pathologists and Bacteriologists. Bethesda, MD, American Association of Pathologists and Bacteriologists, 1974. 11 The Boston Society of Medical Sciences first met in 1869. 12 In an independent action, AAPB also was granted 501(c)(3) tax-exempt status in 1967. 13 There are anecdotes that the eventual decision of AAPB to merge with ASEP instead of the IAP led to strained relationships between AAP and IAP (and USCAP) for the next three decades. 14 The two societies also had different dues structures. ASEP's dues were $22.50 or $40.50 depending on whether the member did not or did have a subscription to AJP. AAPB dues (including AJP) were $45. Of 1,326 ASEB members, 461 did not have a subscription to AJP, 346 subscribed to AJP through their ASEP membership, and 519, who were also AAPB members, subscribed to AJP through their AAPB membership. 15 Earl Benditt would have been co-President since he was the AAPB Vice-President 1976-1977. However, Benditt was ASEP President 1975-1976 and declined becoming co-President of AAP, leaving the sole honor to Pierce. 16 After the merger between ASEP and AAPB, it was ASEP that in essence became the "parent" organization by accepting AAPB members into the newly named AAP. 17 ASEP members voted 819 to 69 to approve the merger. 18 G. Burroughs Mider was previously the Director of Laboratories and Clinics at the National Institutes of Health (equivalent currently to the Deputy Director of NIH). The G. Burroughs Mider Lecture, named in his honor after his NIH retirement in 1972, is given annually. 19 Kinney was Executive Officer from 1975 to 1977, during which time he also served as AJP Editor-in-Chief (see Appendix 4.3). 20 As a result, the last annual FASEB meeting at which it was required that the constituent societies all meet together was held in 1992. ASIP joined four other FASEB societies to organize a joint Experimental Biology meeting starting in 1993. See Essay 8 and Appendix 3. 21 Heated discussions during the Long Range Planning Committee deliberations centered on the name change. A return to the original (ASEP) name narrowly lost out to the new ASIP. 22 Subsections eventually evolved into the current Scientific Interest Groups. 23 AAP was not officially dissolved as a corporation in the state of New York until 1995.